The other week, Huawei’s HiSilicon lifted the lid on the details about its new high performance Kirin 960 mobile application processor, and it looks like it’s squarely aimed at taking on Qualcomm and Samsung in the high-end SoC market this time around. So, let’s take a closer look at the finer details that the Kirin 960 is bringing to the table, which goes above and beyond just improved performance. To re-cover the basics, the Kirin 960 is an octa-core big.LITTLE CPU design, based on four high-performance ARM Cortex A73 cores clocked at 2.4GHz alongside four low-power Cortex A53 cores clocked at 1.8GHz. The chip is also the first SoC to make use of ARM’s latest Mali-G71 GPU and is built on a 16nm manufacturing process, which will feel familiar from this year’s Snapdragon 820 and Exynos 8890. The CPU aspect of the new chip is very similar to the last-gen Kirin 950/955, albeit with ARM’s latest high performance Cortex-A73 replacing the A72s that ran at 2.3/2.5GHz. Despite making no real changes to the clock speeds of the 950 and 955, we’re looking a notable 10- to 18-percent increase in “typical performance” between the A72 and A73, thanks to improvements in the core design. It seems that HiSilicon has found a CPU power envelope that it’s happy with for ARM’s high performance cores at 16nm. The Cortex-A73 is also designed to sustain peak performance for longer, before thermal throttling pulls the core back. This means you’ll be able to make the most of the chip’s peak performance for longer, which is great for gaming and other CPU intensive tasks. Along with this CPU improvement, HiSilicon has spent time optimizing the memory system of its Kirin 960 to keep the CPU and GPU better fed. There’s support for the latest LPDDR4 RAM at 1800MHz, which offers a 90 percent performance improvement of its last generation LPDDR3 implementation. There’s also new support for UFS 2.1 flash memory, which is already being used by Samsung and Qualcomm instead of the eMMC standard. This improves read and write speeds substantially, and allows Huawei to improve its file encryption performance, a key metric with the introduction of Android 7.0 Nougat’s Direct Boot mode, by 150 percent. Flash memory read speeds have seen a huge increase, according to Huawei’s slides, which should result in much faster app opening times and faster loading for things like gallery images and videos. This, along with the boost to flash writing speeds, will be particularly handy for saving and playing back higher resolution content, such as 4K video. On the GPU side, performance is up a staggering 180 percent over the previous generation Mali-T880 MP4 GPU used inside the last generation Kirin 950, thanks to the new Mali-G71 MP8 clocked at 900MHz. The G71 offers a 20 percent power saving and 40 percent better performance density than the Mali-T800 too, and HiSilicon has opted for eight cores this time around for a plentitude of graphical horsepower. HiSilicon’s GPU performance has previously been a little way behind the market leaders, but this time around the Kirin 960 will be competing with the very best. By avoiding thermal issues and sustaining a high CPU frequency over time, the Kirin 955 already boasts superior GPU utilization and consistent frame rates. 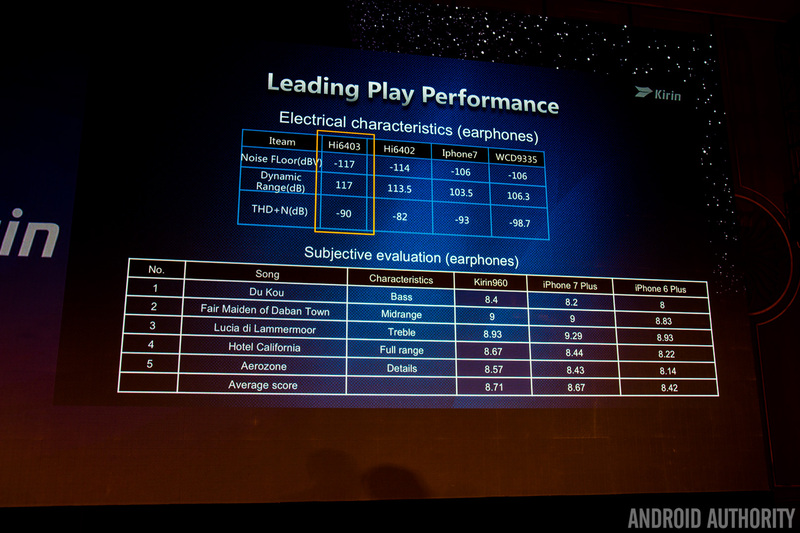 This will only improve the new Cortex-A73 CPU and more powerful Mali-G71 GPU. While we’re on the subject of GPU’s, the Kirin 960 boasts that it’s the first processor to market with full support for the Vulkan API. Vulkan is promising big performance gains for mobile devices, thanks to superior multi-core support compared with OpenGL ES, and is likely to play a key part in many virtual reality titles too. Huawei claims that using Vulkan can improve graphics performance by anything from 40 percent to 400 percent in mobile titles. Clearly, this is a wide margin and goes to show just how variable GPU and CPU workloads can be between applications. Combined with the better heat management of the Cortex-A73 CPU cores and the more energy efficient G71 GPU, the Kirin 960 should eek out some very nifty performance from titled built around the Vulkan API, as well as existing games and 3D or graphics applications, including your image gallery and general UI tasks. The Mali-G71 is also built with virtual reality applications in mind. The G71 supports fast 120Hz display rates to avoid image smearing, 4x multi sample anti-aliasing for cleaner 3D edges, and 4K screen resolutions for extra high pixel density panels. With the nitty gritty out of the way, we can delve a little deeper into some of the additional features packed into the Kirin 960. HiSilicon has made sweeping changes to its image signal processing chain, audio support, and security tools, but we’ll start with the new connectivity options. To better compete with chip-giant Qualcomm, Huawei has boosted the performance of its latest LTE modem and has also introduced support for CDMA technology, which usually requires a license for Qualcomm’s patents. Instead, HiSilicon has created its own custom CDMA solution. This is important, as Huawei won’t have to rely on Qualcomm modems or processors to launch its next handsets in markets that make use of CDMA networks, such as the Verizon and Sprint networks in the US. HiSilicon has its own CDMA solution, so it won't need Qualcomm licenses to sell phones on networks like Verizon. The new LTE modem incorporated in the SoC introduces support for 4 component carriers (4CC) for LTE versus 3CC on its older chipsets, which essentially adds extra channels for data throughput when using LTE-Advanced carrier aggregation technologies. This also has the added benefit of adding 6dB of signal coverage over 3CC, meaning faster speeds while roaming away from cell towers. On today’s fastest networks, this allows the modem to hit peak data speeds of 600Mbps. In other words, the Kirin 960’s LTE modem supports Category 12 download, with 4x carrier aggregation, 4×4 MIMO, 256QAM spatial stream modulation, and download speeds of up to 600Mbps. The SoC also boasts Category 13 upload capabilities, which tops out at 150Mbps. This is right in the same category as the Snapdragon 820 and the Exynos 8890. Huawei debuted its dual-camera technology in the impressive P9 and this seems to be the core of the company’s photography focus going forward. The Kirin 960 is being used to improve the photography performance and features in future devices that use dual cameras. The design is still based around the its previous Monochrome sensor technology, but native support for an RGB and Monochrome depth processor has now been built directly into the SoC. As a result, the company is now also able to collect more depth mapping information than before, which allows for better refocusing effects and superior detail in low light situations. Taking and refocusing a photo should now also be faster, as depth information is processed inside the SoC rather than being sent out to an external ISP. During the presentation, HiSilicon made references to the 2x optical zoom capabilities of the new iPhone 7 Plus and announced that its down technology can go further with a 4x optical zoom. It’s not clear if there’s a telephoto lens involved, but either way the sensor’s appears to be able to detect multiple points of focus, as opposed to just two with the iPhone 7 Plus. Not only does this allow for a wider range of bokeh refocusing options, but also enhances the range of zoom options available. However, this will depend on the actual optics used in the phone as well. Another big new focus with the Kirin 960 is security. HiSilicon has gone so far as to implement its own inSE solution that extends the default Android and ARM TrustZone options, along the lines of Samsung’s Knox. This three tiered security solution can be adapted depending on the use case requirements. On the chip itself, the Kirin 960 features a larger 4MB pool of secure storage space, with 100x faster bandwidth and 50x faster RSA-1024 encryption with which to store security keys for fingerprints and the like. There’s virtually zero chance of anyone being able to physically tamper with this part of the SoC, unlike if an external security IC is used. This is all quite important as Huawei is eyeing up a move into mobile payment systems. The company has been able to add encryption and decryption algorithms required by the finance sector. Huawei boasts that the new chipset is certified by both UnionPay and the People’s Bank of China’s new digital requirements for mobile payments. In fact, the 960’s security has been certified up to the CFNRA’s highest level which is authorized for transactions up to a value of 1 million RMB. Huawei is looking beyond just mobile payments too, and envisions that its inSE system could be used for secure data ranging from PhotoID information to using your phone as a car key. HiSilicon is also paying more attention to audio this time around. There’s a new embedded DSP and its third generation Hi6403 codec on board, which boasts an improved noise floor of -117dB and a dynamic range of 117. This bests the iPhone 7’s codec and the Qualcomm WCD9335 found in today’s flagships. However, its THD+N characteristic of -90dB doesn’t quite match up to the competitors, but is an improvement on the previous Hi6402 IC. The Hi6403 supports overkill audio formats in the form of 32bit 192KHz PCM, as well as the DSD lossless format. It also consumes 17 to 33% less power than before. The new Hi6403 audio codec bests the iPhone 7 and the Qualcomm WCD9335 for noise and dynamic range. The Kirin 960 also employs new -10dB microphone background noise cancellation technology and there’s HD Voice+ for calls over LTE, which offers twice the sample rate of of VoLTE for clearer sounding call quality. While we’re on the topic of media, the processor packs in 4K30 HEVC/H.265 video decoding and encoding too. Tying a lot of these extra sub systems together is the company’s latest i6 co-processor. Just like the last generation i5, this lower power core can be used to handle GPS navigation, always-on display functions, and context aware applications like Now on Tap. There’s a 40-percent typical decrease in power consumption between the i5 and i6, thereby extending battery life for low power tasks. An overview of all the new features (colored orange) inside the Kirin 960. The Kirin 960 is undoubtedly HiSilicon’s best SoC to date, thanks to a range of new high-end features, and it handily competes with the best SoCs on the market right now. Of course, the Kirin range is likely to remain reserved for the company’s own smartphones and will be appearing in the Huawei Mate 9 first. Even so, it’s going to be very interesting to see how well the processor stacks up against the upcoming Qualcomm Snapdragon 830 and Samsung Exynos 8895 flagships, although these chips are still several months away and will have the advantage of being produced on a smaller process. Still, there’s always the option of a 10nm Kirin 960 refresh (Kirin 965?) at some point in the future too. Something tells me it’s going to be a close run race next year.